2 A little over half of Indian adults (54%) are satisfied with the way democracy is working in their country, but a third are dissatisfied. 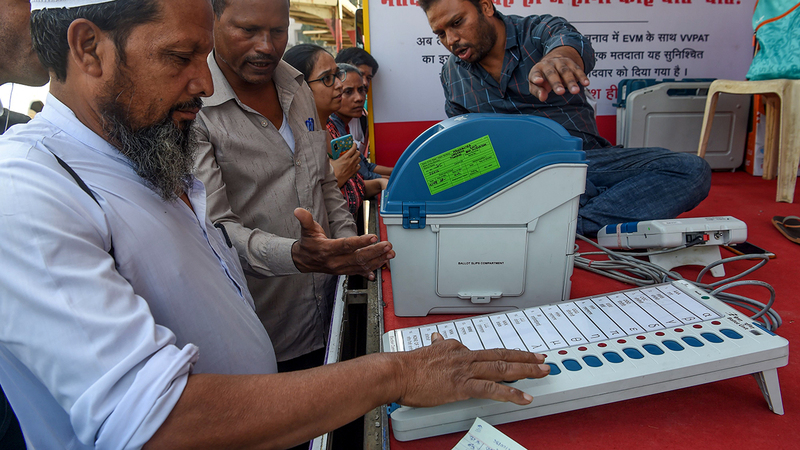 Men are more likely than women to give Indian democracy a thumbs-up, though one-in-five women decline to offer an opinion. Satisfaction with the state of India’s democracy also differs by party affiliation: Three-quarters of BJP supporters are satisfied, compared with only 42% of Congress adherents. 3Indians largely view Pakistan as a threat and believe the situation in Kashmir warrants more military force. The recent escalation in tensions between India and Pakistan after the Pulwama attack has turned the long-running territorial dispute over Kashmir into a potent campaign issue for Modi. In the Center’s spring survey last year, 76% of Indians said Pakistan is a major threat to their country, including 63% who said it is a very serious threat. This view was shared by people in rural areas and urban centers, supporters of both the prime minister’s BJP and the Congress party, as well as Indians across age groups. Additionally, 65% said terrorism is a very big problem in India. When asked specifically about Kashmir, a majority of Indians (55%) see the situation there as a very big problem. More than half (53%) say circumstances in Kashmir have gotten worse over the last five years, and a majority (58%) believes the Indian government should use more military force than it uses currently in dealing with tensions in the area. 4 Many Indians are using mobile phones to get news, but the public is divided over how these devices have influenced politics. About eight-in-ten Indian adults say they own or share a mobile phone, and most of these users (81%) say their phone has helped them obtain information and news about important issues, according to a separate 2018 survey. 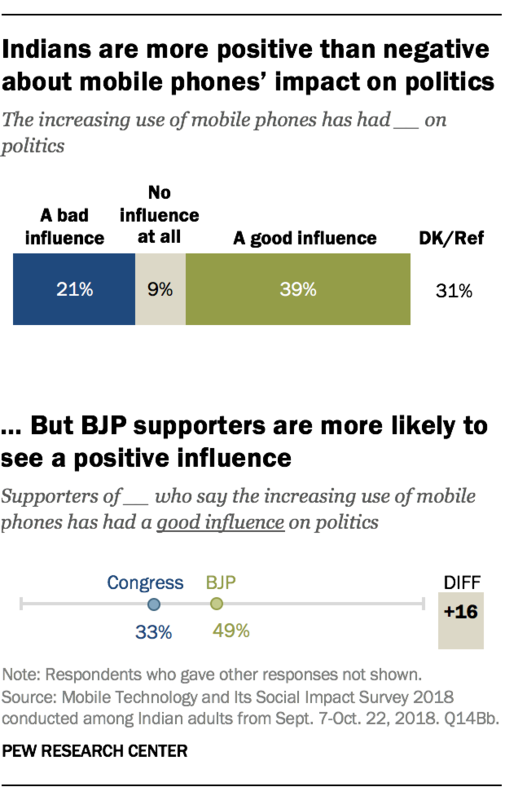 However, Indians have mixed attitudes about mobile phones’ overall impact on politics. About four-in-ten say the increasing use of mobile phones has had a good influence on politics. Indians feel similarly about the impact of the internet on politics: Again, about four-in-ten say it has had a good influence. However, only a minority of Indians (38%) currently go online. 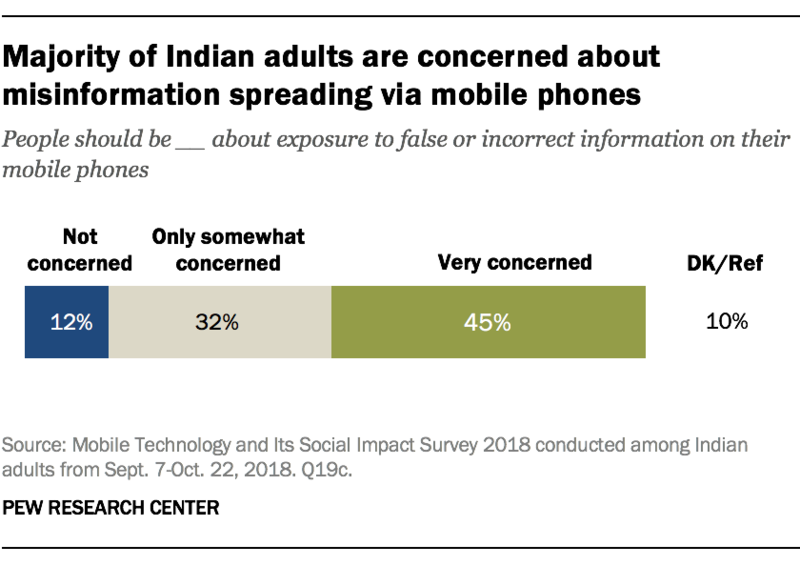 5 Roughly three-in-four Indians (77%) say they are very or somewhat concerned about people being exposed to false or incorrect information when they use their mobile phones, including 45% who are very concerned. Similar shares of both BJP and Congress supporters say they are very concerned. This finding comes amid recent violent attacks attributed to viral WhatsApp hoaxes and concerns about the app being used to spread fake news. Of the seven social media and messaging apps included in the survey, WhatsApp and Facebook are the most widely used in India – although relatively modest shares of Indian adults (29% and 24%, respectively) report currently using them. While this means a majority of Indians do not use these apps, the 1.35 billion-person country still has the largest number of WhatsApp and Facebook users in the world. In the lead-up to this spring’s election, some mobile apps are taking steps to curb the spread of misinformation. WhatsApp, for example, says it is using artificial intelligence to help spot fabricated news; the company says these efforts have led it to suspend more than 6 million user accounts over the past three months.